Self-adhesive tape suitable for all traditionel uses and for printing. The structure of PVC backing ensures excellent plasticity and rigidity mechanical features. The thick layer af adhesive gives high tack to various surfaces. Colors: Brown, white and transparent. (aprox. 18 degrees Celsius). Do not store at low temperatures. 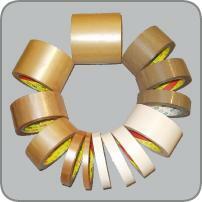 Under normal conditions our sealing tape are not toxic and do not usually cause problems on contact with the skin. However, the normal precautions should be used when handling and hands should be washed after use. Our tape is not suitable for medical use or for bandaging.